Gov. 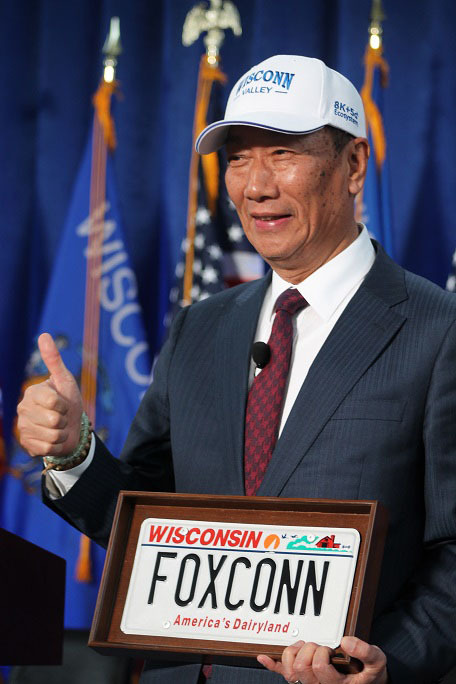 Scott Walker and Foxconn Technology Group Chairman Terry Gou have signed off on a $3 billion contract for the Taiwanese company to build a massive display screen factory in southeast Wisconsin. Walker and Gou signed a contract Friday that locks the state into providing up to $3 billion in tax incentives if Foxconn invests $10 billion on a new display screen manufacturing factory and campus near Racine in Mount Pleasant. The Taiwanese company would also have to hire 13,000 workers to get the full benefit. It is the largest state tax incentives package offered to a foreign company in United States history. At the signing Friday afternoon at the headquarters of S.C. Johnson & Son Inc. in Racine, Walker said the LCD panels produced at the plant will be world class. "We're just getting started, cause we're going to take the world over when it comes to high-tech technology like we're going to build, did I say, right here in the state of Wisconsin," Walker said. Gou is personally guaranteeing up to $500 million if Foxconn does not fulfill its side of the contract. Gou said it was "great to be home" in Racine County, and thanked government and private sector leaders for supporting the company. Among the lawmakers at the event was House Speaker Paul Ryan, R-Janesville. He said the LCD technology Foxconn is promising will provide jobs for many people and help convince younger workers to stay in Wisconsin. "We want to make sure that the kids that are growing up in Wisconsin stay in Wisconsin. You ever heard this term, 'brain drain?' This reverses brain drain," Ryan said. Ryan also said President Donald Trump instigated the deal by making the connection between Foxconn executives and the state of Wisconsin. The signing comes after the state Legislature approved general terms of the deal. Wisconsin beat out several other states for the plant. Several Democratic state lawmakers have criticized the contract. State Senate Democratic Leader Jennifer Shilling released a statement saying she's not convinced the Walker administration is able to protect taxpayers and hold Foxconn accountable. The Wisconsin Democratic Party said "rather than invest in Wisconsin-owned businesses across the state, Walker has chosen to gamble $3 billion in tax dollars on a foreign corporation with a history of broken promises." Editor's Note: This story was last updated at 4:35 p.m. Friday, Nov. 10, 2017, with comments from Ryan and Shilling.